As if I haven’t got enough to do I’ve now volunteered to do a butterfly survey each time I complete my monthly bumblebee survey at Morgans Hill. In truth it isn’t that much more work and as generally there are more butterflies than bumblebees it’ll make it more interesting. I’m not anywhere near as good at identifying butterflies as I’d like to be so I’m really looking forward to improving my knowledge. 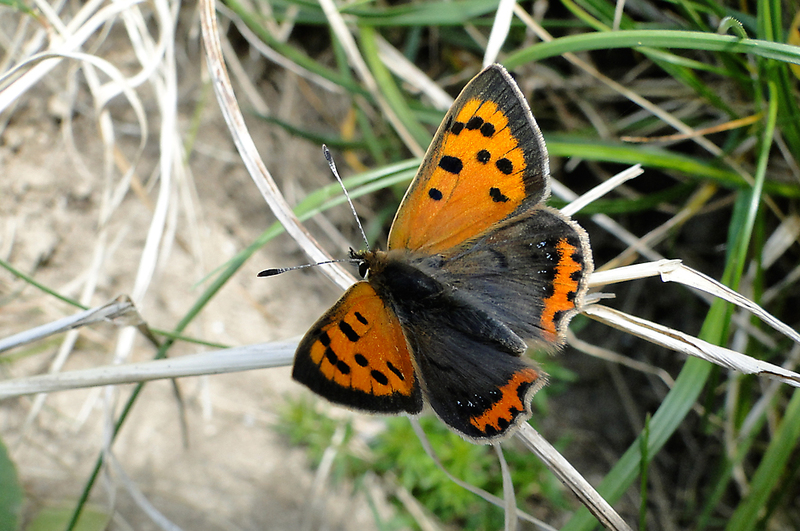 I’m ok with the more common ones but not quite so good with the rarer types.Above is a bit of a favourite of mine, the rather quarrelsome Small Copper Lycaena phlaeas. You might just about be able to pick out some faint blue speckled markings on the hind wings. When this makes a clearer line of blue dots this form is called caeruleopunctata. There is even a rare white and black albino form.